This comes under the heading of ‘Stuff I’ve always “known.” In other words I don’t know where I came across it, or whether it’s actually true, but it makes sense. The run-off would be channelled within the structure, eventually ending up in some form of reservoir which would be used in time of siege. The first part is sort of necessary. After all, water is one of the most damaging things to a building, so it would have to be channeled in some manner. My question was a little more specific. I get absurdly excited by things like cross-sections. As far as the reservoir thing goes, I’m a little less sure. A source of water, usually a well, seems to have been considered a necessity. It might have been channeled into a reservoir, but not for necessarily for use during a siege. usually for flat roofs, one does have fulboras where water is collected and drained either through the columns or gutters on the side of the building. Thanks, Noel. I figured you’d have an answer. But did they have the technology in the eleven and twelfth centuries? The book I was reading mention casting lead for pipes, so I guess it’s possible. 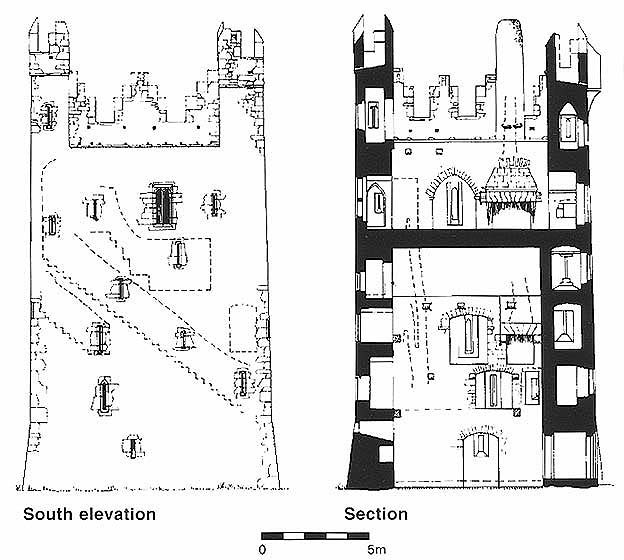 Here’s a cross section of an Irish tower. The plans are fun to look at, too. With the massive walls, I think they could have concealed the rain water down pipes somewhere or else they would have problems with the roofs. It’s interesting to see how much they have within the walls. 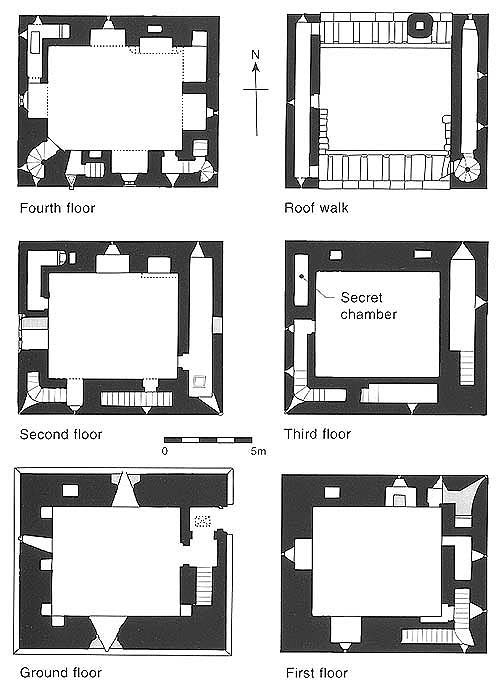 The heating is not so much of a puzzle – they had huge open fireplaces built into the walls. As far as the mass market goes, the aristocracy probably lost, but I’m not sure European peasants did so badly. I’ve always had the impression that life was hard for poor Europeans under feudalism. yes, the rich definitely lost. the poor I think gained somewhat. At least they would all get some decent housing. That there should be debate over the shape of the roof is not surprising, as few (if any) survive. Those castles that were not destroyed by war, or “slighted” (partially or completely damaged to make them militarily useless) were left to decay when such buildings were no longer needed. Thanks for taking the time to give me the link. It’s not too late at all, since there was no real deadline. So it seems that they did have gutters. I’m not entirely sure about what technology they had at what time (and also where) beyond the obvious. Flat roofs seem entirely possible in the Mediteranean, but so impractical in England. That makes me wonder if there were flat roofs on any other buildings – also if the climate was the same. I learned about the slighting on a trip to Florence about a decade ago.